Froyo & gingerbread 40 %, ice cream sandwich & jellybean 50 %. Better, but not good enough. Jelly Bean continues eating away at Gingerbread's share, but version 2.3 of Android still accounts for over a third of all devices. The latest Android usage figures have been posted on the Android developer dashboard, and there's the usual mix of good and bad news. The good news is that Jelly Bean continues to erode both Gingerbread and Ice Cream Sandwich, and versions 4.1 and 4.2 combined now account for around a third of all usage. Version 4.1 of the software has in fact overtaken version 4.0 for the first time, with 29.0 percent share compared to Ice Cream Sandwich's 25.6 percent. 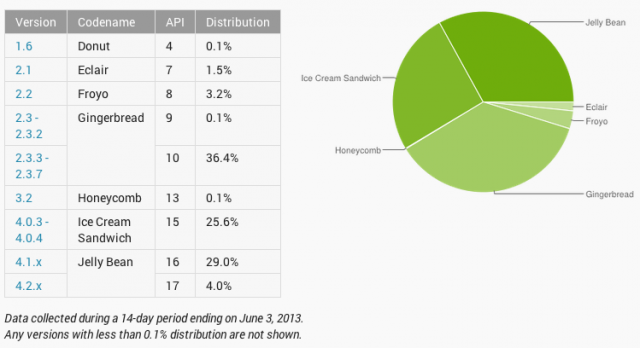 All told, version 4.x of Android now accounts for 58.6 percent of all devices accessing the Google Play store. The bad news is that versions 2.2 and 2.3 (Froyo and Gingerbread) still account for a combined 39.6 percent of all Android usage, and while they continue to erode from month-to-month, they still represent a rather large piece of Google's dessert-themed pie. Also bad is that while "Jelly Bean" is now on a third of all Android devices, only four percent of those devices are actually running the latest version of the software. Aside from waiting for Gingerbread devices to be replaced by newer ones, Google is taking some steps to fight platform fragmentation. It is doing so partly by separating several Android components from the OS itself and partly by working with its partners to offer always-up-to-date "Nexus experience" versions of popular phones like the Samsung Galaxy S 4 and HTC One. However, for consistency's sake (and for the security of the platform), we'd still like to see OEMs work harder to adopt new versions as they come out.